He’s so good they elected him twice….. Yes, people all over the country, no the world, will be smiling with amusement and disbelief today, as Boris Johnson became London Mayor for the second time. 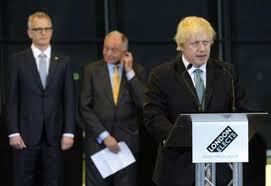 Oh how we laugh; bumbling Boris to govern Londoners for another four years, my sides are still aching. At least Boris is no threat to Cameron now! As for Ken, that’s twice he lost out to an idiot; even the Green party asked people to vote Ken second and he still didn’t win…..time to give up Ken and let the legend of Ken be told of how the GLC took on the might of Thatcher, rather than you failed against Boris Johnson. It’s no wonder no other city wants an elected mayor, you just can’t trust the public.